Not nearly as good as desperado, but still kind of fun with it’s large ensemble cast, lively action, and quirky performance by Johny Depp. Once Upon a Time in Mexico is meant to be the epic movie that wraps up the trilogy, which made Robert Rodriguez the Hollywood success that he is. The first movie in the trilogy, el mariachi, is what kick-started his career as a filmmaker. It was an independent movie made on a very low budget and yet it came off like an action flick. Rodriguez brought the film to festivals and got his name buzzing around with it. That led to desperado, the second and absolutely the best movie in the trilogy. Artistically masterful, it was not only a fantastic mystery, but had a sort of legend feel to it, about the mariachi with a guitar case full of guns. Everything about that movie was great, from the actors, to the dialogue, the shots, and even the music. Desperado was the movie that took Rodriguez and brought him from an indie director to a big time Hollywood master of the screen. It was his pulp fiction. And so it was only right that now, after achieving the ultimate level of success, Rodriguez would be able to return to the story and make one last movie to wrap up the trilogy. It was to be a movie, which would end it all with the biggest budget and most action-packed lineup of stunts yet. Unfortunately, throwing too much at the screen can be a bad thing, and in the case of this movie, it certainly was. The movie isn’t bad, but it is most definitely the weakest of the trilogy. I suppose that’s usually how it works when an indie director is given a huge budget to play with. And he did want this movie to be epic in scope, which is exactly the way it ends up feeling. part of the problem is that the movie doesn’t really have a star. is antonio banderas the star again? Maybe. or maybe it’s johnny depp, playing cia agent sands, who is for some reason in mexico stirring up all kinds of trouble. at the start of the film, sands is sitting down at a bar with cheech marin, asking questions about the guitar player. that gives cheech the opportunity to tell some stories and start talking this guy, much like the way desperado began with steve buscemi’s stories about the mariachi. only this time it’s not nearly as much fun. our eyes are on johnny depp more than the mariachi, as we wonder what this guy is up to and who he is. we get even more intrigued when he stands up to reveal that he had a fake arm resting there on the table while his real arm was underneath it, holding a gun. In a sense, depp becomes the buscemi character, meeting in secret with the mariachi (meeting in a priest’s confession booth, just like buscemi did), and discussing future jobs. only depp is also up to much more. apparently he’s targeting a drug cartel, which is why he also approaches a retired fbi agent and convinces the man to get back to work looking into members of the cartel and their associates. this former agent starts targetting mickey rourke, who is more than willing to cooperate. basically, there’s nothing going on there. no real excitement to that plot line. banderas meanwhile, is put on the case of a man named general marquez, who murdered his wife and daughter. the wife is carolina, the salma hayek character from desperado. she’s here in this movie too, only in flashback. and one flashback at a time, we slowly build to the revelation that she was brutally murdered. in that way, the three movies are connected, because in each one the mariachi character loses the love of his life or is grieving over her loss. at the end of the first movie, his love was killed. in the second movie, he seeks revenge for her death, while also meeting another woman (hayek). then in the third movie, he seeks revenge for hayek’s death, which supposedly happened sometime between the second and third movie. i’m glad salma hayek was in this movie and that we got to see how she died rather than just here about it. when a lot of movies can’t get an actor back for another sequel, they justify it by saying in the movie that the character died. rodriguez is one of the only directors who will get the actor back for a number of scenes, just to reveal that they are all flashbacks and that she has already died, before this third movie even began. that aspect of the storyline i was impressed with. but otherwise, this story was way out there with too much going on. sands not only gets the mariachi and the former fbi agent working for him, but he also hires a current fbi agent, played by eva mendes to tail members of the cartel. meanwhile, there’s a connection between the general who the mariachi is after and the cartel boss, barillo (willem dafoe, playing a mexican). barillo has hired general marquez to kill the president of mexico. there are so many actors on board here and so many threads being pulled. mickey rourke, willem dafoe, eva mendes, danny trejo, depp, banderas, hayek. compare that to desperado which was really just the guy. the villain, the girl, and his friend (Buscemi). i suppose trejo was in there too, but that was it. if a name actor wanted to make an appearance (like tarantino did), it was for one scene only. a quick, funny cameo. here, rodriguez has crafted whole plot lines out of the actors he could get involved. it reminds me of what kevin smith did with dogma, getting a huge cast together and then trying to come up with parts for them all to play. it’s not a good move for the cast to dictate the script. some of the characters that this movie could have definitely done without are the ones played by rourke and trejo. i don’t even know what danny trejo’s purpose here was other than to be a bounty hunter and one more obstacle the mariachi had to overcome. and rourke’s role was absolutely pointless considering how easily he just went along with the fbi agent. at least trejo’s role led to some action scenes. speaking of action scenes, they are all pretty good in this movie. there’s nothing amazing or on par with hong kong martial arts or even with what rodriguez was doing in desperado, but it’s still better than most movies. that’s because rodriguez doesn’t just have his villains get shot. he has sparks fly out all over the place while they’re getting shot. he has the actors who are taking bullets to the chest go popping backwards into the air as if the bullets launch them at rapid speeds back against the walls. it’s incredibly exciting and a lot more fun than just seeing someone fall to the ground. the movie does work in the long run and that’s in large part due to johnny depp. he is the guy to watch here, clearly on top of his game and having fun with the character. this movie came out the same year as pirates of the carribean did, and was released right after that movie started raking in tons of dough. at the time of it’s release, depp’s name was the hottest in cinema and she showed why with his role here. the movie itself has a lot going on and that ends up being a bad thing when it gets overly complicated. 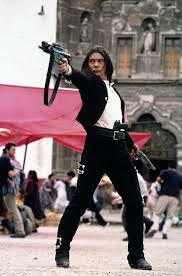 but the action is good and the humor is there and rodriguez never loses his sense of style. it’s an enjoyable movie, but it certainly has it’s flaws.